Kevin De Bruyne was born June 28th, 1991 in Drongen, Ghent to successful business power couple Herwig and Anna De Bruyne. The result of his parent’s success was that Kevin spent his formative years travelling through England and Africa, whilst his Father made investments in the oil trade. Kevin’s first taste of competitive Football wouldn’t come until very late on, he played at School level from the age of 4, but all the travelling made it hard for him to settle in a team, at 14 De Bruyne made the decision to leave his Parents side and joined the Genk Academy. Away from home, he learnt to live independently very quickly, he honed his skills as a player too and begun to garner media attention just a year after joining the academy. He was highlighted in the national press alongside Courtois, Lukaku, Kompany and Vertonghan amongst several others as a future member of The Belgian National Team starting XI. Unlike similar articles that are written by British press about the plethora of English Golden Boys we’ve seen come and go, the reporter got all but one player spot on as a future Belgian National Team player. Kevin would make his Genk First Team debut aged 18 and fully established himself the next year aged 19, winning the Belgian Pro-League Title in his first full year, contributing to the teams’ success with five goals and 16 assists. He followed that up with another outstanding season the following year, scoring eight and supplying 19 assists, also agreeing to join Chelsea in the January of 2012. He would see out the season at Genk and move to London in June 2012, making his debut for Chelsea in friendly the next month. De Bruyne would make just 3 League appearances before being loaned out to Wolfsburg, nothing unusual there for a Chelsea team that regularly has 30-40 players out on loan at any one time. What was unusual about the De Bruyne loan was that unlike several of his colleagues, De Bruyne looked every bit the complete player that could have offered Chelsea much needed depth to their first team. This was further justified by his performances for Werder Bremen, scoring in the September after his arrival in a 3-2 defeat and then rescuing a point late on in his next game in a 2-2 draw with Stuttgart, he’d also score a crucial winner in a 2-1 victory over Fortuna Dusseldorf despite Bremen being down to 10 men. De Bruyne final act for Bremen would be to secure them another year in the Bundesliga, staving off the threat of relegation in the last game of the season with an equaliser against Frankfurt. Kevin would prove to be a shining light amongst a gloomy season then for his foster home, whilst many were ready to admit De Bruyne was ready for a starting birth at Chelsea, this wouldn’t be Kevins only foray into German Football. 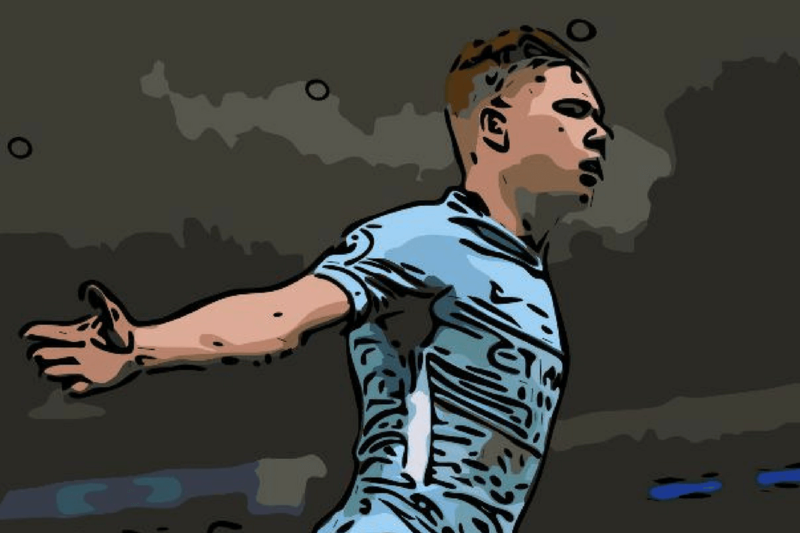 If you are enjoying this piece on KDB, then you’ll probably like our one on Ruud Gullit! De Bruyne would return to Chelsea in fine form, he had a very encouraging pre-season and all the signs were there to suggest he was Mourinho’s man to ignite a less than creative Midfield. Sadly it was not to be, De Bruyne hardly got a sniff by the time the regular season rolled around and despite assisting in his first appearance against Hull City, the writing was on the wall come January and an offer from Wolfsburg was too good to turn down. Wolfsburg would pay a premium £18m for a player who had made a total 3 League Appearances for Chelsea in 18 months. Fortunately for them, he would have an immediate impact, making his debut against Hannover in 3-1 loss, their first since the October previous, his efforts would help Wolfsburg a string of positive results after and finish 5th in The Bundesliga. De Bruyne first full season would result in success too, an outstanding return of 16 goals and record-breaking 21 assists would see Wolfsburg finish 2nd and De Bruyne named Bundesliga Player of the Year. He would make all the right noises in Europa League too, cruising through the group stage containing Everton, Krasnador and Lille, Kevin would key in helping Wolfsburg to victories over Sporting Lisbon and Inter over two legs, before succumbing to Napoli in the quarters. His performances in the league and Europe put top clubs on notice once more and had people questioning why Chelsea let him go so easily. De Bruyne started the season at Wolfsburg despite the speculation that he was on the move and it wasn’t long after a DFL-Supercup Win over Bayern Munich that a move away from the Volkswagon Arena would materialise. Manchester City would win the race for Kevin signature with a bid of £55m accepted on August 10th, De Bruyne was back in The Premier League just shy of 3 years after signing for Chelsea. City were not as hesitant in offering De Bruyne the opportunity settle his unfinished business in England, he replaced Aguero against Palace and scored his first goal against West Ham a week later. He scored in City victory over Sunderland in the league cup and again in 6-1 victory over Newcastle, De Bruyne was off to a flyer. Kevins hot start with City combined with his record-breaking Bundesliga run was enough to see him make the 23 man shortlist for the 2015 Ballon d’Or, surely the first of many? His first season in Manchester would see Champions League success as well, topping the group by a single point ahead of Juventus, City would make it all the way to semi-finals losing to eventual winners of the trophy Real Madrid 1-0 over 2 legs. Kevin’s second full season with City would see a crucial managerial appointment, Pep Guardiola. As good as De Bruyne was before, playing under Pep would raise his game to another level. De Bruyne would score six times and register 18 assists, doubling his contribution from last season, City finished 2nd in their Champions League group behind Barcelona before being knocked out by Monaco on away goals in the next round. This year has offered much the same, with a very different ending. Manchester City has won The Premier League Title at a canter, losing only twice (so far) to neighbours United and Liverpool, with the latter also knocking them out of the Champions League Quater Finals. De Bruyne has scored nine times and further contributed to City’s attacking success with 18 assists, who have been irresistible this season, scoring 98 goals to date, can City make it 100 goals and 100 points? A great season as a team and individual, but not good enough to pip Mo Salah to PFA Player of the Year, undoubtedly a worthy runner-up and no doubt another Ballon d’Or shortlist will follow in October. Belgium is one of the dark horses in this year’s World Cup, no-one is expecting them to win it outright, but they should get out of the groups and they have a talented enough squad to cause anyone trouble in the Knockout phases. De Bruyne, in any case, will be central to their success, much like at City he’ll keep the midfield ticking, supplying flair and calmness under pressure in equal measure. Belgian Chocolate or Chocolate Teapot? Kevin De Bruyne might well be amongst many lists as a prospective Ballon d’Or winner in the next 2 seasons, as Ronaldo and Messi decline. Rightly so based on what he has achieved in such a short space of time, albeit this season representing his first League title win since his days at Genk. There’s no doubt over De Bruyne skill and if it were that alone that could win you a Ballon d’Or? DeBruyne would win it hands down, but if researching for these articles has taught me anything it’s that as much as The Ballon d’Or is an individual performance award, it’s rarely won without that player winning The Champions League or World Cup in the same year. You could argue that De Bruyne is well placed to win both at some point in his career, playing for a Pep Guardiola side that looks unstoppable 9/10 times and part of a Belgian National Team that admittedly is yet to impress, but seldom do people disagree that they won’t at some point. Should De Bruyne carry his team all the way in either of these competitions, there’ll be few who’ll disagree with his nomination let alone him winning it.